I have received my copy of the 'St Edmund Campion Missal and Hymnal for the Traditional Mass' published by Corpus Christi Watershed. I had ordered it in advance. It is a remarkable volume, very ambitious, but with faults along with its good points. First the pros, then the cons. Pros: First off, it is amazingly inexpensive. I was stunned. 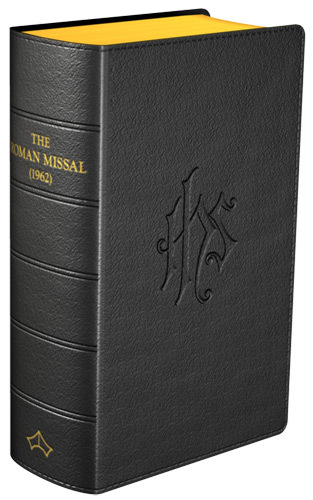 At $22.99 it is only slightly more than one third of the price of the Angelus Press Missal ($65.95); the US price of the Baronius Missal is close to the Angelus Press one ($59.95). (Baronius Press in the UK sell theirs for £39.95.) Now I have it in my hands, I can say this is not a cheap knock-off by any means, being full colour throughout, on good quality paper. It has two versions of the Ordinary of the Mass, one for Solemn and one for Low Mass, which I think is unique. Each of them is illustrated with photographs of the Mass as it proceeds, one per page. The one for Solemn Mass includes all the ceremonies unique to Solemn Mass. This is brilliant: clear, attractive, intuitive. The photographs themselves are extremely good - as an amateur photographer of the liturgy I am very, very impressed. They use excellent angles, imaginative use of selective focus, they are all pin-sharp and perfect. No corners were cut here. They were taken in the lovely FSSP church in Rome, Sta Trinita. There are some nice photos of medieval manuscripts showing the text of the Mass. I must say, however, I'm not really sure why they are there. They aren't something you are going to be using, in the way you use the other things in a missal. Another pro is that it has a lot of chant in it. But then it has so much chant, this rather turns into a con: for it contains all 18 Kyries and all 6 Credos, plus a large number of vernacular hymns, many with the music, which take up the second half of the book. As someone who sings a chant kyrie twice most weeks, I've never sung half of these, nor half of the Credos: they simply aren't needed for the ordinary Mass-goer. As for the vernacular hymns, whatever the editors may imagine these simply aren't sung at Mass in most places, and where they are sung, at Mass or outside it, hymn books are invariably provided. What is the point of having an inevitably limited selection of hymns in the back of your missal when on the occasions they'll be needed, you'll be given another copy? Unless everyone in the congregation has a copy of this book, no one is going to announce 'Love Divine All Loves Excelling is number 943 in your Campion Missals'. Looking the thing up in the index before locating it is guaranteed to make you miss the first verse. And you may find the rest of the congregation singing it to a different tune to the one printed in your missal, too. These are the reasons, if you think about it, why hymn books have traditionally always been owned by churches and handed out, and not bought by the laity: it doesn't matter if we all have different missals, but it does matter if we have different hymnals. Other cons: as per my photograph, the paper is gloss. Not a good idea under bright lights the reader can't control. The Latin Mass Society's move from gloss to matt paper for the Mass of Ages was greeted with great relief, especially by our older readers. 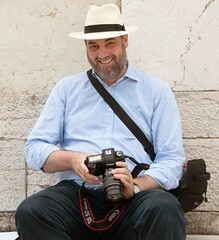 You can get good photographic results with the right kind of matt. It is so large (23.5 x 16 cm: more than 9" by more than 6") and so very heavy (1.35kg) that to say it is practical for taking to Mass is stretching a point. There is no reading ribbon: very surprising in such a lavish book, where you need to flip between the Ordinary and the Propers ten times or so per Mass. And, finally, the big one. Everyone used to a traddy hand-missal knows that the Sundays are in the first half, the Ordinary is in the middle, and the Sanctoral cycle is in the second half. But the second half of this one is taken up with vast quantities of music no one is ever going to use. So where is the Sanctoral cycle? This is what makes the inclusion of all that music really incomprehensible. To include it, they have sacrificed the Propers of most days of the year. Yes, I know that not many people go to daily Mass, but a lot go to Mass on odd days when they get the chance, and those are the days when you really need a Missal, because it is much less likely anyone will have put out sheets for you with the propers on. Indeed, you hardly need a Missal for Sundays and Holy Days, you'll almost always be offered a missallette with the Ordinary and a sheet printed off from Una Voce Orange County with the propers. So, nice though it is, I don't think this Missal will displace the Baronius Press or Angelus Press missals as the market leaders. For UK reader I have to recommend the Baronius Press one, as it has the local feasts of England and Wales and of Scotland. If you want a Sunday-and-big-feast-only missal, you can buy genuinely pocket-sized missals: the one on the left is available from Cenacle Books for £12.50. I think the Campion Missal really makes the grade, not as a pew-missal, but as a reference book. It will be a great resource for teaching children (or adults, come to that) about the Mass, and then all the features, including the music in the back, come into their own. So thank you, folks at Corpus Christi Watershed. I'm not sure what exactly you thought you were producing, but this is a splendid book which will give me and my family years of use. I'm just not going to take it to church. Good review. It seems that it's not quite as wonderful as those in the Rorate Caeli comboxes would have us believe. If I buy it at all, I'll definitely be waiting until the next edition comes out. By the way, is it in any way infected with post Vatican II newspeak such as "Extraordinary Form," "mutual enrichment," or "hermeneutic of continuity"? Will we see such terminology anywhere at all in this missal? Also, Watershed also sells one "Vatican II Hymnal." Is this missal at all tainted by any of these? The term 'usus antiquior' is used in the Preface and 'Extraordinary Form' in the Intro; on the cover it calls it 'Missal and Hymnal for the Traditional Latin Mass'. But there's no commentary on the texts or anything so the issues about mutual enrichment etc. don't arise. I think you're missing the point of the book. It is meant to be a congregational resource, placed in the pews for anyone to use who wishes to do so. Thus, it contains the hymns and music of which you speak. This is also the reason why it is a little heavier than most other missals. That being said, this is in fact the PERFECT missal for family devotions, which, for some, might include singing a hymn and reading the Sunday lessons. But it is far too bulky to have piled up to hand out to the congregation! It is far bigger than anything I have seen intended for congregational use. Just imagine what 50 or 100 of these books would look like piled up, how difficult to store, how heavy to hand out. And the binding is unsuitable for the hard knocks it will get in such use. It will look scruffy after 6 months and the covers will fall off in a couple of years. And if it is for the congregation, why does it have all that extraneous material such as photographs of ancient manuscripts? I don't mean to be rude, I just point out that there is a reason why hand-missals and congregational hymn-books are made they way they are. If the publishers took a different path by accident then that is a strange mistake to make. If they did it on purpose they must have had a different objective in mind. It is intended only for Sunday use, and thus contains all Sunday and Holy Day Masses and those for all other feasts that can be used for Sunday Mass when they fall on a Sunday. Most traditional Masses are (lamentably) still scheduled for Sundays only. Since it is not intended as a personal hand missal, the fact that it contains no daily Masses is irrelevant. Anyone so fortunate as to attend a daily TLM will surely have his own treasured hand missal to carry with him. In my view, it is designed very well (and evidently deliberately) for its intended use as a combined pew missal and hymnal, containing just the limited number traditional hymns proportional to their reduced usage at TLMs. As such, it is thinner and lighter than many or most common hard-backed pew hymnals seen in pew racks nowadays. Finally, although there was no ribbon in the already sold-out first edition, the second edition that is currently being sold does have a ribbon--for switching back and forth between Ordinary and Propers (which for each Mass are all in one place). The book is not designed to replace a hand missal. As said above, it is a pew resource. At the Church where I am Cantor and conduct the little choir, this has been the greatest resource I have ever seen for the congregation. In St. Thomas, Ontario at Holy Angels, we begin with a processional hymn and a recessional hymn in English either from this hymnal or the one in the pew, Catholic Book of Worship II. There are suitable hymns in both. More importantly, the Congregation has all the music to sing the Asperges and Vidi Aquam, and they do. Mass I, II, II, IV, VI, VIII (which was all they knew), IX, XI (the other they knew), XII, XV and XVII, both Kyrie, the first for Lent the second for Advent, and two "ad libitum". They have mastered Credo I, II, III, IV and this past year, they learnt V and VI. Why should the congregation not sing the Ordinary and the riches of the whole Kyriale? I am humbly "proud" to say, I don't know another congregation than this that can sing all of this. Because, I have forced them to learn to read. By changing the Masses (not weekly, but seasonally and monthly) I have forced them to learn to read the neums rather than just memorise Mass VIII. I should add, every Mass ends with the appropriate Marian Antiphon following the Last Gospel. I suggest that if every congregation did this prior to the Council the radical element would not have succeeded in forcing a false active participation upon the world.